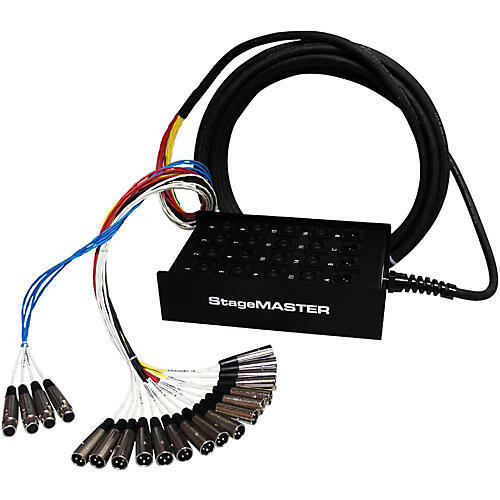 Open Box Pro Co StageMASTER SMC Series 20-Channel Snake 100 ft.
StageMASTER SMC Series 20-Channel Snakes are designed and built to provide the greatest value possible. StageMASTER Stage Snakes are not outsourced. They are manufactured in Pro Co's own facilities, by their employees, according to the strictest quality standards. Pro Co takes pride in providing you with a system that you can rely on at a price you will appreciate. Each StageMASTER Stage Snake stagebox is constructed of a steel connector panel chassis and a heavy-duty steel U-channel enclosure designed for excellent shielding and protection of connectors. The stagebox is coated with a durable black powdercoat finish with white silkscreened channel identification numbers. Box connectors are rugged Neutrik "D" Series nylon XLR female input panel connectors and returns are "D" Series XLR male connectors. The stagebox is wired with SN Multipair Audio Cable to a fanout with Rean (a Neutrik brand) Male XLR connectors and Rean (a Neutrik brand) Female XLR connectors.